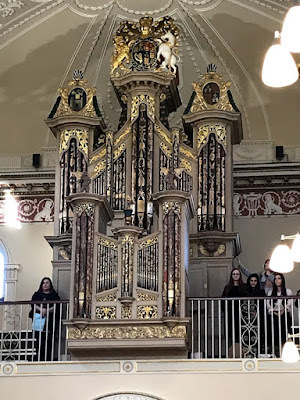 When I was in Trinity College Dublin this week for the Michaelmas commencements at which 12 of my former students received their masters’ degrees in theology (MTh), some of us were listening to the newly restored organ in the Public Theatre. The organ, housed in an historic 1684 case, has been overhauled and refurbished, and for the first time since that work was played at this week’s commencements. The organ case is one of the very few surviving organ cases made in the 17th century by Lancelot Pease. As the academic procession was about to begin, the organist began to play Johann Sebastian Bach’s Air on a G String from his Orchestral Suite No. 3 in D Major. The piece only attracted its present name in 1871 when the German violinist August Wilhelmj (1845-1908) made a violin and piano arrangement of the second movement of this orchestral suite. By changing the key into C major and transposing the melody down an octave, Wilhelmj was able to play the piece on only one string of his violin, the G string. Few of us thought of this, I imagine, or of Jacques Loussier’s arrangement for jazz trio that was used as the background music for a long-running television commercial for cigars. Fewer still would have remembered that Procol Harum borrowed from this piece for their 1960s hit, A Whiter Shade of Pale. It was, perhaps, my last formal academic role as a professor in Trinity College Dublin. In a discussion with my former colleagues from the faculty from the Church of Ireland Theological Institute, we wondered whether Bach had been chosen because of the number of theology degrees being conferred. And we went on to wonder which composers suited each academic discipline. There may be too many nominations for history, given the number of composers across the centuries who are still listened to today. But I suggested Vaughan Williams for English literature, or, perhaps, agricultural science, Mozart for Math, Verdi for Italian, Palestrina for Latin, Debussy for French and, of course, Theodorakis for Greek. Which disciples and composers would you match? Gustav Holst for astronomy (The Planets). Modest Mussorgsky for the arts and painting (his piano suite Pictures at an Exhibition). Felix Mendelssohn for Holocaust Studies, given the way the Nazis tried to suppress his work. Rimsky Korsakov for biology or zoology (Flight of the Bumblebees written for his opera The Tale of Tsar Saltan). Edward Elgar for European Studies … especially Pomp and Circumstance or Land of Hope and Glory if someone has worked on a dissertation on the crisis brought about by Brexit. Ross Daly for Interfaith Dialogue as part of the MPhil in Ecumenical Studies. And, as I looked at colours of the academic hoods for Economic Science and wondered whether the colours represented Gold and Silver, or simply emphasised copper for coins, I thought of Abba for Economics (Money, Money, Money). That may sound crass, but then the news from banks over the past weeks has been worse than that.